It is six in the morning, my doubts about the wisdom of entering another 10km Open Water swim are at their peak, but it’s too late – I’m committed and awake. I am – of course – also grossly underprepared, not that that prevented me when I hauled myself nonstop round three laps of Dorney Lake last year. So, no excuses. 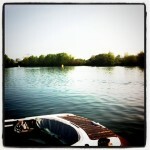 If anything the inaugural Jubilee River Swim is a far more palatable prospect than circling a lake. Taking in nearly the entire length of the Jubilee River between Maidenhead and Eton the route is certainly more scenic, and aid stations at the three weirs along its length give opportunities to exit the water, regroup and recover. This is more sportive than race. It is also still a long way to swim. 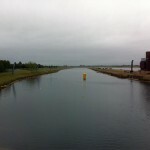 A point that the twenty minute bus ride to the start at Boulter’s Lock reinforces. Perhaps I should walk back! Instead I change into my wetsuit, adding a liberal coating of vaseline anywhere I suspect might chafe, and stumble along the first of many gravel paths to the swim start. A brief safety briefing. Then into the water. It is colder than I expect, my open water swimming having been limited to the sea around Lanzarote; I’m not convinced I will warm up in this river. A few moments to acclimatise and we start. Casually. None of Ironman’s frenetic rough water – nobody strikes me around the head or pulls me under the water. My goggles decide to leak of their own accord. At first I ignore it, closing my right eye and sighting with the left; five hundred metres in it occurs to me I have a long way to go – I stop to adjust them. From there it is plain sailing. My arms feel fine, I’m relaxed, I’m comfortable in the water; I’m warmed up and could easily keep swimming. Still, I’m happy to exit 1.9km downstream at the first weir and aid station. I had been sceptical about the idea of a swim sportive, but the relaxed atmosphere, the chance to chat with fellow Tri2O Club members and in particular the presence of cake wins me over. Enough that I re-enter the water with a degree of enthusiasm. Perhaps this is my downfall. Another relaxed start and before long I settle into a rhythm; I feel good, strong, I pick up the pace. This is great, 10km is going to be easy. 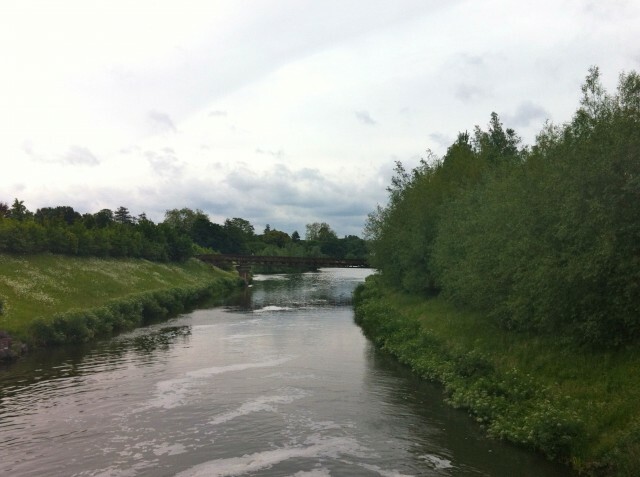 A kilometre downstream the water thickens, my arms turn over, and I barely move; I recall Challenge Henley – how well I’d started and how slowly I’d finished the swim; once again I am swimming through treacle. I try to maintain focus, to stay in control, but I weave down the river desperately sighting for the yellow buoys that mark the next weir. Eventually. A few more bridges downstream. They appear. My enjoyment of the cake at this aid station is subdued by the awareness of what is to come. Two more stages, shorter than the last, but long enough; at least – by my calculations – the distance is slightly short of 10km. That’s something. I get back in. It’s colder. The third stage of 2.6km is uneventful. After the painful second stage my pacing is more controlled, I find a steady rhythm that balances forward propulsion against the soreness in my arms and I stick with it. This isn’t a race and I’m not timing it yet every so often I find myself chasing another swimmer, pushing a little in an attempt to overtake them. My efforts are pathetic, I’m exhausted and still I’m drawn into miniature battles of my own devising; as if reaching the cake stop a few seconds sooner counts for something. It seems you can take the competition out of the event, but not out of the athlete. For a moment it looks like the final stage might be postponed – a family of swans defiantly stands on the bank blocking our entry to the water. Nobody dares approach out of fear they will be the one to demonstrate the arm-braking power of a swan’s wings. We wait until some cautious shooing persuades them they are better off upstream and then slip into the cold water for the final time. A mere 1.5km, a sprint in comparison to what has gone. There is more ferocity to this start, the water churns as we squeeze under the first bridge, swimmers bumping together in the darkness. Back into the light and the bunch split. I try to find feet. My goggles leak again. Any hope of an easy ride is long gone by the time I readjust them. But I push on, at least in figurative terms – at this point there is little to distinguish a hard effort from an easy one. Arms ache, arms go round, each stroke brings me closer to the finish. Once more I desperately sight, this time for the finish, when it finally comes into view I put in a ‘sprint’ to finish the job. Out of the water, medal, more cake and a few congratulations to fellow swimmers. I feel a sense of accomplishment as I walk back to the car and it goes someway to compensating for the ache in my arms. I ponder the next 10km, there’s one in Bray lake in a couple of months time.